Welcome to our first "All Things BERNINA" newsletter for 2018. We have lots of news and classes to share with you! There seems to be some confusion where to lubricate this hook system. BERNINA has just informed dealers of a new way of doing this. 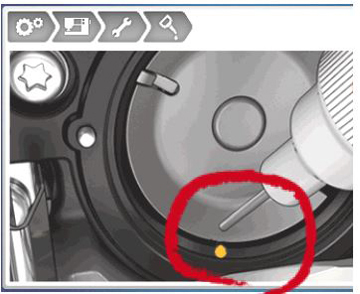 In the current user manual BERNINA shows to lubricate the reservoir. With the latest Firmware updates for the 7/5 Series machines the lubrication animation shows how to lubricate the actual shuttle race. It is recommended to use the new process to lubricate the shuttle race directly. BERNINA has had many cases reported where extensive reservoir filling caused oily threads and discoloration of the fabric. For additional information and color images showing the process step-by-step please click here. This Book will tell you everything you want to know about the many, many presser feet and accessories that are available including suggested techniques. 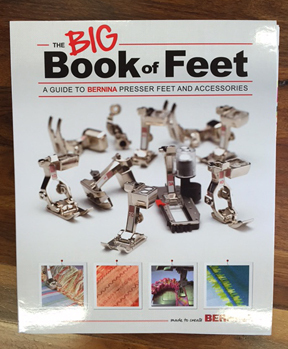 The Big Book of Presser Feet was recently revised to include new accessories and feet (the new Ruler Feet for example). If you have the book, you can download the new pages that are included in the newest version by clicking here. If you don't already have a copy of this great resource, come by today to pick one up. The two diagonal grooves in this foot act as a guide, making zipper insertion a breeze. Foot #35 is a must have for garment sewing and home decorating projects where an invisible zipper is used. Enjoy 25% off on this foot February 1-28, 2018. 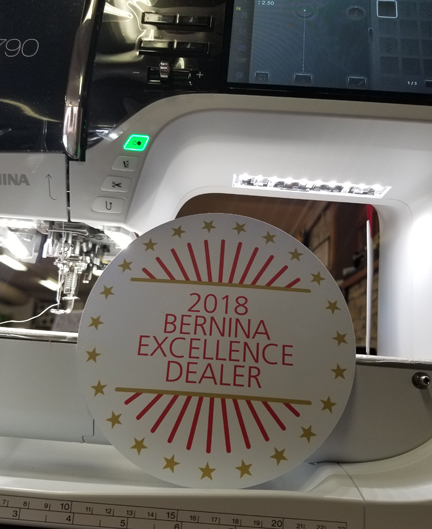 BERNINA is offering 5 years (60 months) no interest, equal payment financing February 8-12 on purchases of $3,000 and up (on approved credit, of course). 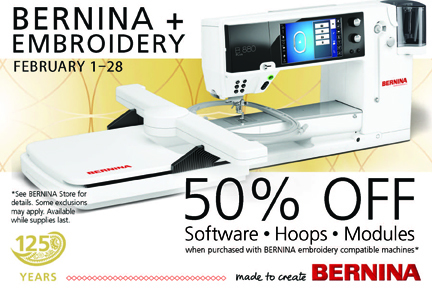 Now is a great time to come take home a new BERNINA! 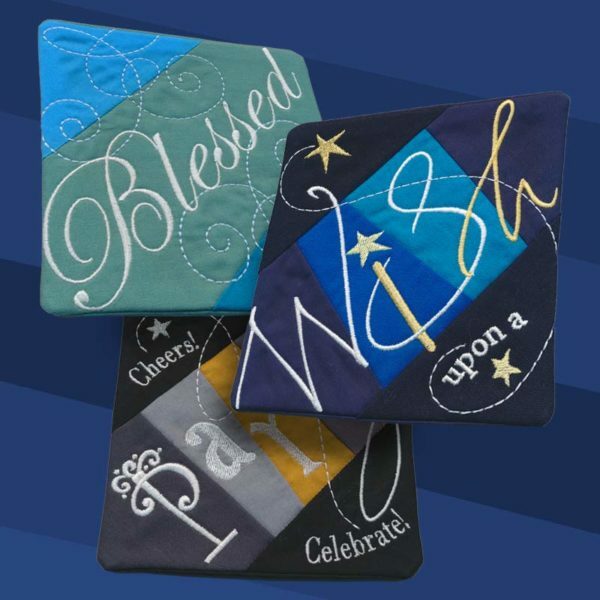 We are so happy that we have added quite a few new embroiderers to our customer base and want to make sure they get classes to increase their skills and confidence. If there is specific type of embroidery project you would like to make in a class, let us know. Also, we are trying a variety of times for classes. What works best for you? 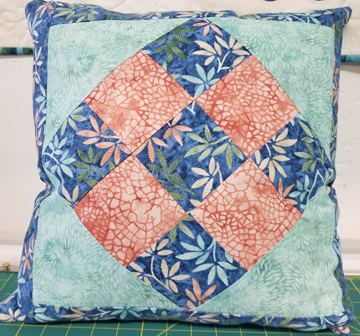 - March is National Quilting Month. and make a pillow in the process. 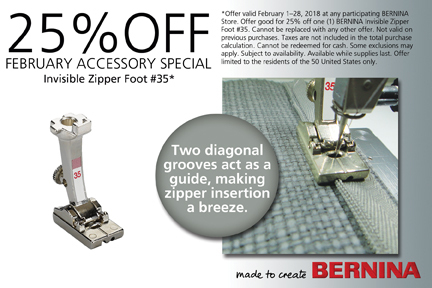 - 25% off BERNINA Presser Feet: Start making your wish list now. Feet will all be 25% off March 15-19.
club the beginning of April. Stay tuned!